Anyone watching the Rangers @ Islanders game on Sunday afternoon might have seen quite the gesture from Islanders' Defenceman James Wisnieswki. Wisniewski was standing near the Islanders' net when Sean Avery approached, and the two began chirping back and forth. The Islanders' new defenceman then made an obscene gesture towards Sean Avery that was caught on tape. TSN is reporting that NHL Commissioner Gary Bettman was in attendance but did not happen to see the incident when it happens. 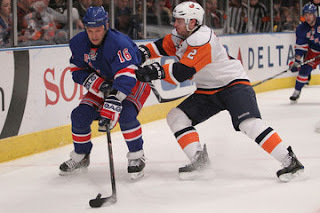 Rangers' fowrard Sean Avery is often at th ecenter of controversy. Of course he may actually have a right to be annoyed if the league does nothing to Wisniewski for his actions on Sunday. "It's pretty obvious what the guy was doing," Avery said of Wisniewski, "but I'm sure nothing will happen to him because nothing ever happens. It's interesting, he'd get a warning for something like that. "Can you imagine if I did that? They sent me to rehab the last time I did something. It's crazy." best line : Wisniewski gave the international gesture for "it's hot out, i'd like a popsicle"